With spring in full swing, it’s time to start planning your next family vacation. 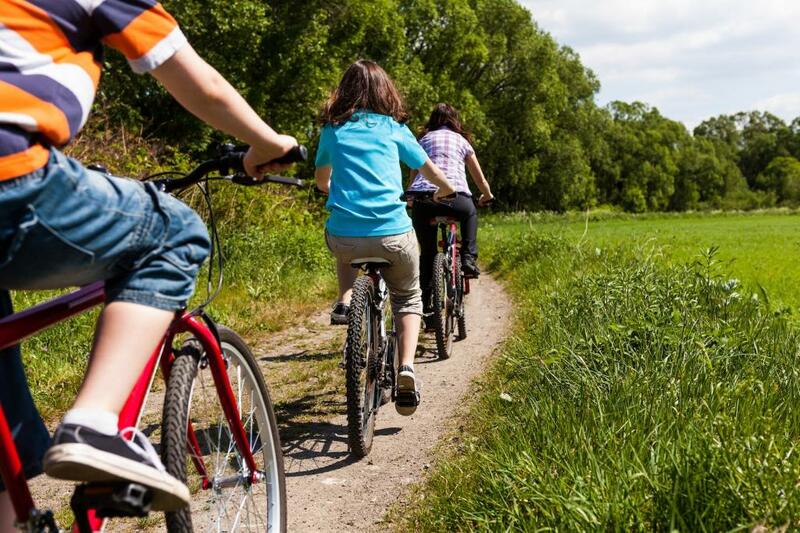 We’ve gathered a list of great places to consider for families that enjoy getting out and riding together. All offer family friendly rides, accommodations and extracurricular activities the kids—and parents—will be sure to enjoy. Ride around town on Raleigh’s comfortable and functional hybrid bike, the Cadent 2. For all around family fun, consider a Root Beer & Bike tour where the adventure starts with a desire to ride. Beer & Bike Tours offer special itineraries focused on family adventures in Glenwood Springs, Boulder and Fort Collins, CO. With stop options including a working farm, science discovery museum, ice cream parlors and a family friendly beer garden, a Root Beer & Bike adventure is the perfect combination of fun for the whole family. The company specializes in great riding and wonderful recovery beverages, so if you like to recharge with a hoppy brew, root beer, cream soda or ice cream float, Beer & Bike Tours has you covered. Didn’t bring your bike? Raleigh Bicycles provides the ride and trailers are available if you’ve got young ones in tow. For a family with all members over 21, Beer & Bike Tours offers trips all over the world. From Maine to Florida to Europe to Japan, find the crossroads of great beer and amazing cycling. Visit www.beerandbiketours.com for more information. 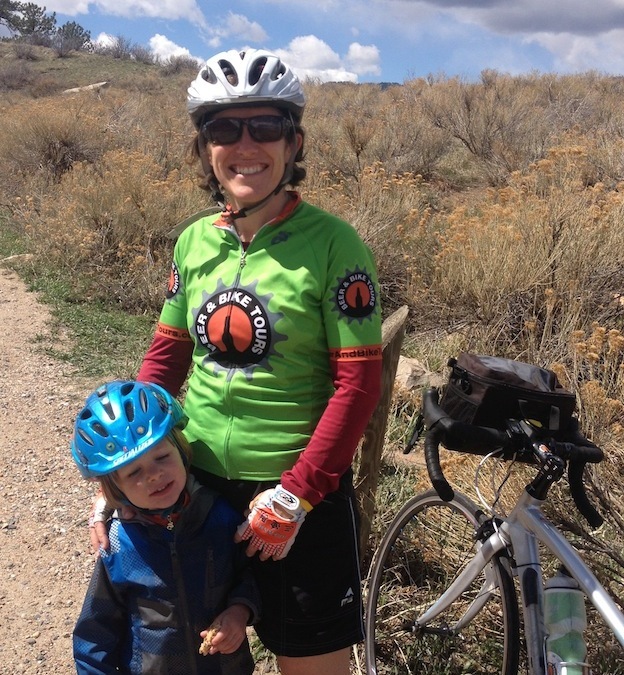 Two happy customers on a Root Beer and Bike tour in Colorado. Whistler regularly tops our list as a great choice for families looking to venture a little farther from home. The best season for biking in this picturesque mountain town is summer, and this berg north of the border is no stranger to the two-wheel tourist. Boasting, “paved paths and flowing singletrack, freeride playgrounds and epic alpine trails,” the mountain municipality caters to all levels of riders. Whether you have teenagers eager to try out the Whistler Bike Park for its world-class downhill and freeride mountain biking, want to cover some scenic ground on the endless network of cross-country trails or desire an easier cruise around town on the popular Whistler Valley Trail with the tots, this place seems to have it all. 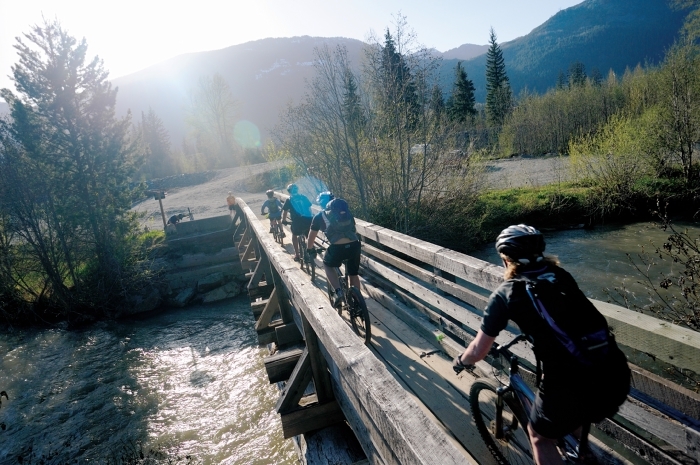 For trail maps, bike rentals and bike-friendly accommodations, visit the Whistler Tourism site. 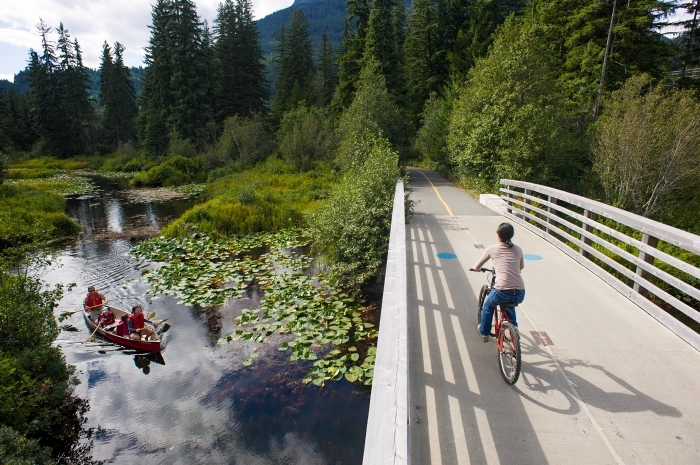 Cycling on the Valley Trail over the River of Golden Dreams in Whistler, Canada - photo courtesy of Tourism Whistler / Mike Crane. Feature image courtesy of Tourism Whistler / Steve Rogers. It’s no secret that San Diego has some of the best weather year round, but with more than just sunny skies and a beautiful ocean view, San Diego is home to miles of protected bike lanes for the perfect family excursion as well as an array of singletrack in the hills to the east. With plenty of flat, paved options for families with younger kids, the city offers easy to maneuver bikeways and spectacular ocean views. A few routes to consider include biking around Mission Bay’s 27 miles of protected bike paths that include a wide range of distances to choose from. Be sure to try the 12-mile Mission Bay Bike Route, and for a more challenging ride, families can venture to Coronado Island to experience San Diego's longest continuous paved trail, the 8.5-mile (one-way) Silver Strand. Perks include uninterrupted family fun and fantastic views of the San Diego skyline. Fat-tire thrill seekers should head for the high ground east of the city and explore classics like the fast and technical Noble Canyon and the breath-taking views of the abandoned Carrizo Gorge Railway. Click here for a great resource on everything you need to know about biking in San Diego. Flying and don’t want to travel with your bike? Visit San Diego Bike Shop for information on rentals. 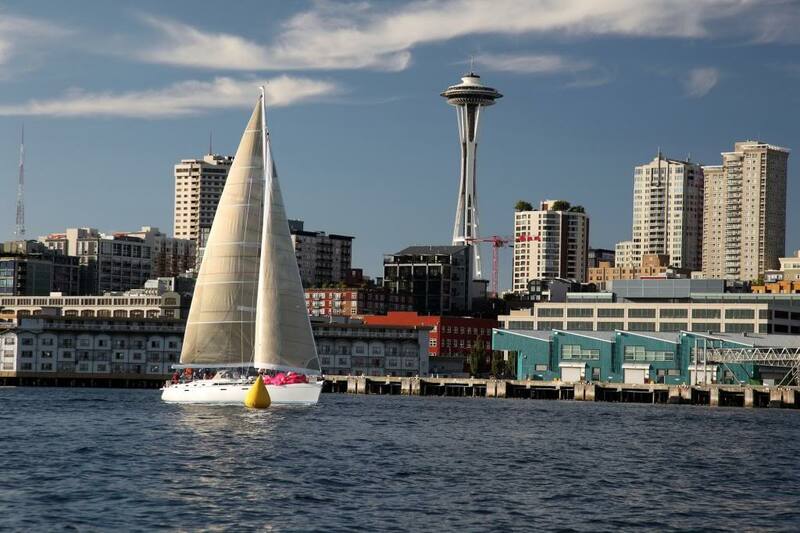 For beautiful scenery and the freshest catch you can find, try a trip to the Pacific Northwest and take a ride around Seattle. Through solid initiatives by the city’s transportation department, this bike friendly town boasts a vast network of bike paths, neighborhood greenways, and will soon be home to several protected bike lanes through People for Bikes’ Green Lane Project. To avoid typical crowds of joggers and more aggressive bikers, consider hopping on the 6.5-mile long Soos Creek Trail. Though mostly flat, kids will enjoy a few gradual climbs and parents can get in more of a workout, especially if pulling the young ones in toe. An optional detour to the Lake Youngs Trail (9 miles, unpaved) halfway through the ride. For those looking for more a bit more adventure, consider going with Bicycle Adventures just outside of Seattle. They offer a wide range of guided trips, with family friendly options including a guided tour of the San Juan Islands with options to camp or stay in kid-friendly inns around the islands. Need a bike rental for your trip? Visit Ride Bicycles. Located just outside of Raleigh, NC and 20 miles from Chapel Hill, Cary is a sweet spot for a cycling in the Southeast. The town was one of 14 recipients of the first Bicycle-Friendly Community awards for "providing safe accommodation and facilities for bicyclists” by the League of American Bicyclists, and is chock-full of paved bike paths, rugged trails and beautiful green scenery. The town’s website provides an extensive list of greenways around town for planning the ideal ride. Considering hopping on the Black Creek Greenway, one of Cary’s longest (7.1 miles) and most popular paved bike paths. From here you can connect to a hub that will link you with several other trails including the White Oak Greenway. Continue on and you eventually connect to the American Tobacco Trail, a continuous trail of over seven miles in length. Need a bike rental for your trip? Visit Durham Cycles. It’s important to consider a few things when planning trips that include two-wheeled travel. Try to choose shorter mileage rides for the kids, and keep elevation gain in mind when choosing routes. Stay hydrated—take more food and water than you think you need. Check tire pressure and brakes—be sure bikes are properly maintained and in working order. If you’re not sure how, swing by a local shop. Always wear a helmet and know your limits. 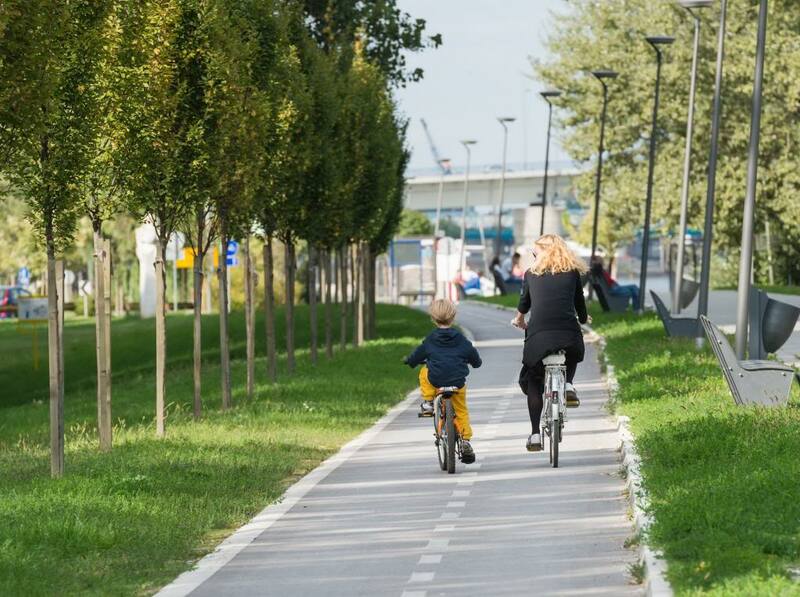 Protected bike lanes and paths are the safest option for inexperienced children and adults alike, so try routes that offer maximum safety—and fun—for everyone. Once the planning is done, get out and ride!